John Gatling was not a man out to promote war and the killing of men with his invention. Instead, Gatling believed that the invention of an automatic weapon would reduce war and the death of soldiers. He thought because the gun would have such a devastating effect on the armies, once seen on the battlefield it would send the other side running. In addition, a weapon that had the impact of many men when used by few would reduce the number of soldiers needed thereby reducing the number of casualties. For these reasons, John Gatling invented and patented the Gatling gun. The first model was a six-barreled, hand-cranked machine gun which could fire 200 rounds per minute. 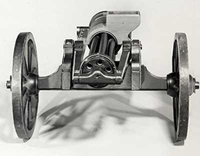 Gatling received US Patent 36,836 on November 4, 1862 for an Improvement In Revolving Battery-Guns. The Gatling gun was not his first invention. 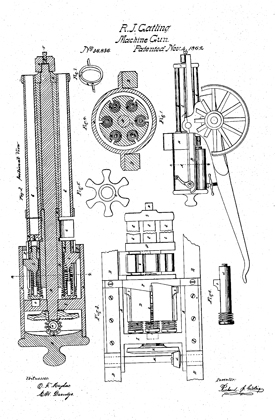 John Gatling had received patents for inventions before the gun. The gun is in fact modeled after Gatling’s seed planter. The seed planter had a round cylinder and a hand-crank. Seeds were put into the cylinder which was turned by the hand-crank. Then the seeds would drop out into the soil. The gun was based on the same mechanism. John Gatling invented his weapon during the Civil War. The gun though was not used much during those battles. The Union Army did not accept use of the weapon because of Gatling’s birthplace. John Gatling was born in North Carolina and although he was living in Indiana at the time of his invention, he was suspected of being involved with the Confederates. The gun was used though by other armies in many other battles. The Gatling Gun was a great success and in 1870, Gatling sold his patent right to the Colt Manufacturing Company. Then in 1897, Colt took over the Gatling Gun Company The US military continued to use Gatling guns until 1911 when the weapon was declared obsolete. ← Invention Geek – Theremin?